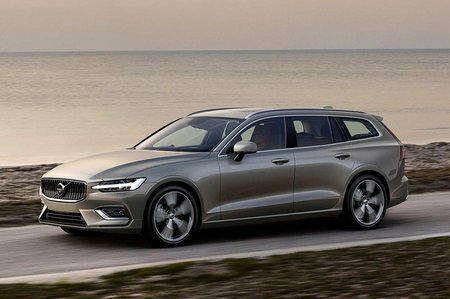 Volvo V60 2.0 D4  R DESIGN 5dr Auto 2019 Review | What Car? This sporty trim is based on Momentum but adds part leather sports seats with lumbar support adjustment, a heated steering wheel with gloss black accents, sports pedals and gearknob, a rear armrest, an auto dimming rear view mirror, 18in alloy wheels, lowered sports suspension, twin exhaust pipes, front foglights and front parking sensors. Worth considering if you don't mind a firm ride in exchange for sportier looks.